Some things were the same: Joe Woodard was a gracious host as always, the attendees were eager to learn and talk about their current opportunities for growth, and the conference location (Atlanta) was hot-hot-hot!! A few things were noticeably different though. This is my third Scaling New Heights, and the sixth that Palo Alto Software has attended with LivePlan. This year, our team noticed a big difference in the acceptance of three key elements of Strategic Advising that are necessary for real growth in the space. As I sat on my return flight home to a much cooler Oregon, I couldn’t help but reflect on them. Three years ago when we talked about strategic planning at the conference, it was not something accountants were connecting with as a means of offering advisory services. But as Geni Whitehouse said in her main-stage speech, “accountants must provide the human element,” by working with their clients to understand their real goals, and translating those goals into a plan. Geni Whitehouse received a well-deserved standing ovation. It’s clear that there’s still work to do in training accountants to have those key conversations. But I believe the industry is hungry now for that education, and it excites me because I know LivePlan can provide it, both in terms of training through the LivePlan Method and the software to support it. Even as recently as last year, there was a real hesitation by many—probably 50 percent of the accountants who visited our booth—about using Quickbooks Online for accounting (versus QBD). As the industry has become more comfortable with cloud-based applications, and as Intuit has continued to upgrade the features of QBO (let’s hear it for job costing later this year! ), the accounting industry has shifted. We heard very few accountants worried that LivePlan does not sync to QBD. 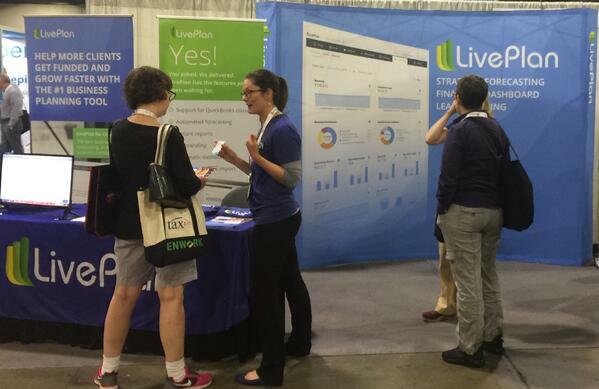 LivePlan made a conscious decision in 2016 to jump fully onboard with QBO (when Intuit did away with their sync-manager for QBD), and we haven’t looked back. We know that the future is in cloud-based software, and we are using our valuable development hours to upgrade the features of LivePlan to support advisory services and strategic business planning. Features like automated Dashboard and Forecast, and support for QBO Classes, are a direct result of this. I would venture to say there has been a sea-change in the last three years in the adoption of value-based pricing. Individuals like Ron Baker and Mark Wickersham have paved the way for accountants to learn how to package and price their services at rates that are fairer for what they provide, and more realistic in a changing industry. Indeed, advisory services cannot be performed for a profit using an hourly model. 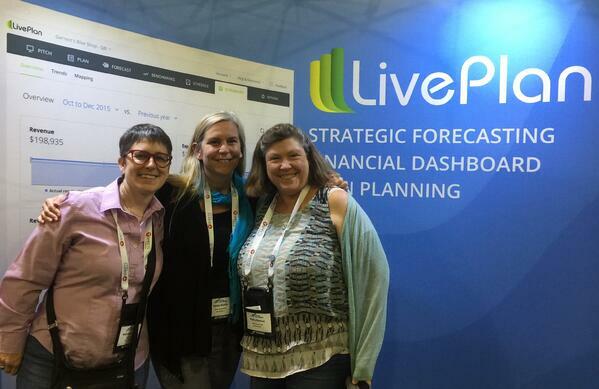 It was nice to have conversations with accountants about how our LivePlan Method system will support a value-based model, and even if they hadn’t fully adopted value-based pricing, that they wanted to get there. LivePlan is happy to have teamed up with Mark Wickersham to be offering training in this area. I am now looking ahead to QBConnect, and the advisory features we have in store for the fall. 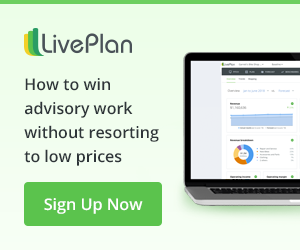 I am excited about LivePlan’s future as an advisory platform, and cannot wait to share our host of training resources to support your Strategic Advising business. These resources will be ready in July 2018. To receive email updates from LivePlan, sign up using this link. Palo Alto Software devotes many resources to staying in tune with customer needs, and to our corporate culture around delivering features to support them. But when LivePlan employees have the opportunity to speak face to face with customers, it makes the process come alive! We remember that our culture of helping small businesses to grow and thrive extends beyond our walls and our culture, to the accountants and Strategic Advisors who use LivePlan to deliver that service. Our customers are an extension of us, and I am proud to be part of it.